If you’re wondering what the Russian government is capable of — as we are, all the time, around here — behold this image. 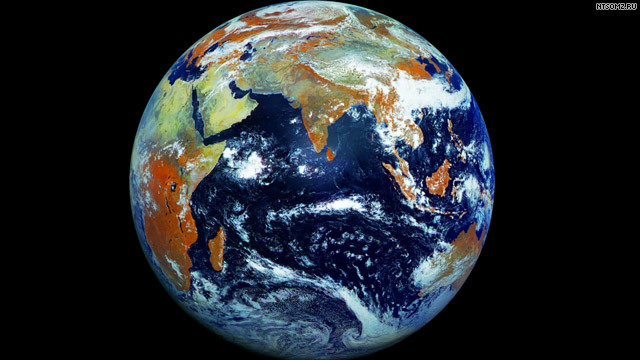 This is the highest resolution photo of earth ever taken. It’s 121 megapixels, snapped 22,369 miles above planet. And it’s ONE PHOTO, unlike other images of earth, which are usually composites of many pictures. There’s an interactive version here, where you can zoom in or out. We also noticed that if you stare directly at the center of the globe in this photo, it appears to move ever-so-slightly. One point worth noting: The camera used special high resolution infrared technology, which shows a rust color over some of the land mass. That’s not an accident. The color is meant to show areas where there used to be lush vegetation. And now there isn’t.